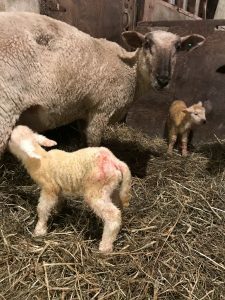 Once again, we have dug back into the achieves to provide an article by Dr. Bill Shulaw that outlines management strategies that can be implemented in order to decrease lamb losses associated with improper management and disease control that may be prevalent during the first few weeks of life. Whether you have raised sheep for a year or 50 years, reviewing this article would benefit all shepherds as it outlines simple control and management strategies that can certainly benefit any operation. There are many factors that affect lamb survival. Serious shepherds should consult the Sheep Production Handbook, produced by the American Sheep Industry Association (www.sheepusa.org), for a more complete discussion of the various conditions and infectious diseases which impact lamb survival. However, if a pregnancy is carried to term, most losses occur in the first 3-4 days of life, and if lambs survive the first 4 weeks, most usually make it to market. Most losses can be grouped in 3 general categories – starvation/hypothermia, pneumonia, and scours (diarrhea). To a large degree, these losses are related to management factors we control, and therefore, a proportion of this loss is preventable. Most small ruminant species are very hardy and have adapted well to their environment and available nutritional support. If one examines which mammals are found in the harshest of the world’s environments, you will find that small ruminants predominate over bovines and other large mammals. If left to themselves, many small ruminant species will deliver their young in the spring, or early summer, when the weather turns milder and forages are most nutritious and abundant. In wild small ruminant species, selection pressure eliminates extremes in birth weights and favors mothers with optimal characteristics in ease of birth, mothering ability, balanced milk production, and ability to thrive with available nutritional resources. One only has to look as far as the white-tailed deer in Ohio to see these pressures at work. Data collected by the Ohio Division of Wildlife from 1997-1999 (published in 2004) indicate that greater than 90% of mature does will give birth to an average of about 1.86 fawns in May and June (Tonkovich et al, 2004). Somewhere between 6% and 10% of mature does will have three or more fawns. Between 30% and 60% of those female fawns (depending on the region of Ohio) will conceive in the following fall when their live weight is about 85 pounds. They will give birth to about 1.21 fawns when they are themselves only one year old. These recent figures are actually somewhat lower than previous research conducted in 1981-82 and may reflect declining habitat quality in some parts of the state where deer numbers have increased substantially since the early 1980s. Each fall we harvest over 30% of these animals during the hunting seasons (over 230,000 in 2007/2008), and car accidents account for many more. Except for the agricultural crops they use, deer provide Ohioans with considerable red meat production with no help from us, largely as a result of our relatively fertile soils and favorable climate. The starvation/hypothermia complex is the leading cause of death in the Great Lakes region. This is a largely a function of the time of year when lambs are born. However, vigorous lambs that receive adequate colostrum and milk (5-10% of body weight) in the first few hours after birth can withstand a significant amount of cold. Some literature from other parts of the world refers to this problem as SME (starvation, mismothering, and exposure). This terminology emphasizes the ewe’s contribution to the problem. Research, and practical experience, indicates that selection for ewes with sound udders, desirable teat placement, and strong mothering instincts can significantly reduce the impact of this problem. Likewise, large birth weights and dystocia, also conditions we can select against, contribute to less vigorous lambs that don’t find the ewe’s udder without assistance. Because lambs have small body weight in relation to their surface area, hypothermia will always be a potential cause of loss, even in lambs born in mild or warm weather. However, we can reduce its impact in our flocks by altering our selection and management practices. Pneumonia is the second leading cause of death in young lambs. Death is most often caused by bacterial infections, usually Mannheimia (Pasteurella) hemolytica and Mycoplasma ovipneumoniae. These bacteria are common in sheep flocks, and the problem strains usually can be found in the nasal passages and tonsils of adult, and often healthy appearing, ewes. Transmission to the lamb is usually by aerosolized droplets, containing the bacteria, originating from carrier ewes. This transmission is favored by inadequate exchange of air and moisture as is often seen in our barns. Poor ventilation, combined with a significant proportion of the ewe flock with chronic infection of the respiratory tract, generally results in pneumonia being a significant cause of mortality in young lambs. The same situation occurs in cattle and some other species. Producers should consider culling ewes with a chronic cough. Increasing the rate of air exchange will, of course, tend to make the barn colder in winter and could increase the risk of hypothermia in lambs. However, starvation/hypothermia problems can be minimized with appropriate selection and management. Pneumonia not only causes significant mortality in young lambs, but also leads to chronic infections in older lambs and ewes. Pneumonia is a leading cause of death and reduced performance in feedlot age lambs. Many infections in these lambs are already established in the respiratory passages, long before lambs reach the feedlot, and only need the stresses of transportation and the feeding program to result in clinical disease. Refinements in building design and reduced animal density in confinement situations are more effective long-term measures to control pneumonia than antibiotic usage. Experience suggests that flocks which lamb outdoors in the spring tend to have a low incidence of lamb pneumonia. Diarrhea in young lambs is caused by several kinds of bacteria, viruses, and protozoa. Lambs that do not receive adequate colostrum are at greatest risk of developing diarrhea. However, even animals that received adequate amounts may still develop diarrhea if the colostrum did not contain specific antibodies to these agents. In addition, colostral antibody can be overcome by a severe buildup of infectious agents in the environment. Lambs with diarrhea may shed hundreds of millions of infectious organisms in every teaspoonful of manure. For many infectious organisms, ingestion of only a few is necessary to cause disease. For example, fewer than 10 Cryptosporidium parvum oocysts are needed to cause a productive infection. As if all this weren’t bad enough, some ewes act as inapparent carriers of these infectious agents and seed the environment with low numbers. One might ask why most lambs don’t get sick. 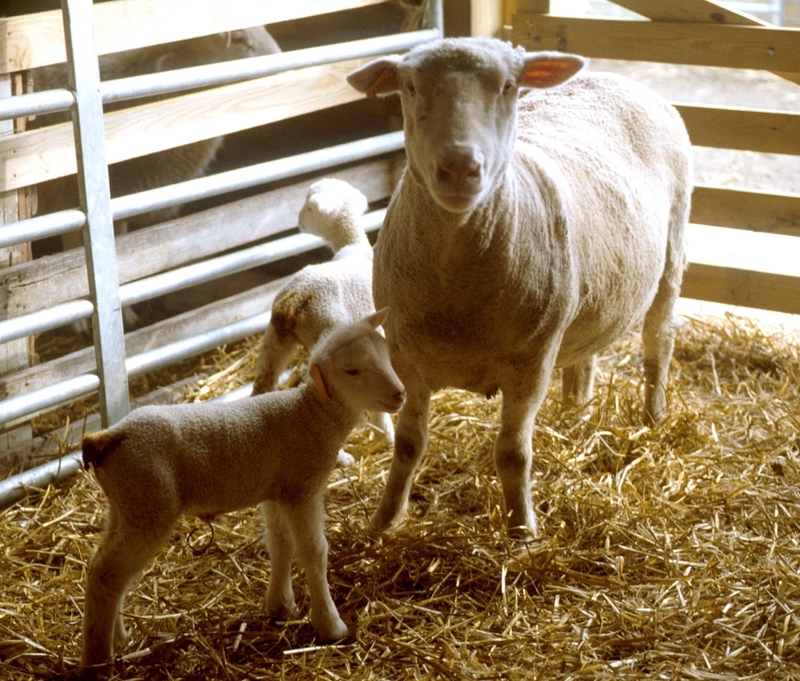 Healthy vigorous lambs, with adequate colostrum, and in a relatively clean, well-ventilated environment, may withstand exposure to low levels of many infectious agents and not get sick. In fact, this is a necessary process in order to insure that their immune system responds to these low level challenges and develops resistance (protection). This exposure process eventually results in replacement animals that successfully make and pass protective antibodies to their own lambs. This is a dynamic situation. It is when things get out of balance that clinical disease becomes evident. Overcrowding, excessive moisture or humidity, lack of bedding, and poor sanitation all contribute to raising the overall level of contamination by infectious agents to levels that result in disease. Infectious agents in the environment are not only acquired by the lamb nosing about the pens, but also by nursing udders which are contaminated by dirty environments. In addition, once a scours outbreak is in progress, much of the environment rapidly becomes contaminated, and many lambs get exposed. Isolating ewe/lamb pairs when diarrhea occurs in the lamb can help reduce the number of cases that develop. Likewise, good overall sanitation with dry, relatively deep bedding can reduce the amount of exposure lambs get to disease-causing organisms. Most flocks harbor many of the common infectious agents responsible for the bulk of lamb losses caused by infectious disease. These agents are either in the environment or harbored by the animals themselves. Whether or not clinical disease occurs is usually a function of the interactions between animals with their environment. Our role in minimizing management factors that contribute to disease development is crucial to the health status of our flocks. Tonkovich et al. Trends in Reproductive Performance and Condition of White-tailed Deer in Ohio. Ohio Journal of Science 104 (5):112-122, 2004. Posted by Braden Campbell at 8:00am February 5, 2018 Posted in Health and tagged Health, Management, Nutrition. Bookmark the permalink.